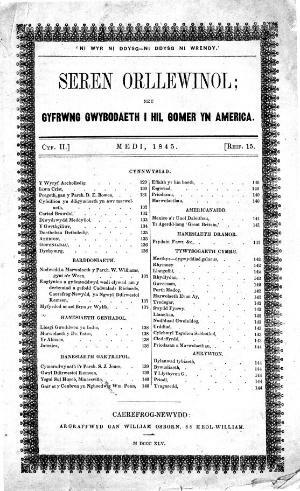 A monthly Welsh language religious periodical serving the Baptists of Welsh-America. The periodical's main contents were religious and general articles, biographies, domestic and foreign news, and poetry. The periodical was edited by William F. Phillips until June 1845, by John P. Harris until December 1848, and subsequently by Richard Edwards (fl. 1840-1884). Publisher Details: [Cymanfa o Fedyddwyr], 1844-1869.